Although I have a passion for blogging, I’ve also made a few contributions to the world of books. Don’t be looking for them on the New York Times Bestseller List anytime soon. To purchase my books, please visit my Amazon Author Page. Thanks! 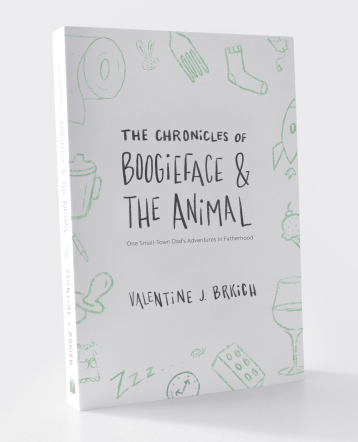 The Chronicles of Boogieface & The Animal is a collection of stories I published on my blog— SmallTownDad.com—chronicling my first 10 years of fatherhood. They are stories of love and laughter. They are also stories of physical and mental exhaustion. For those of you who already have kids, I hope that these tales will bring you a laugh or two as you relate them to your own parenting experiences. 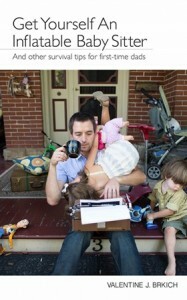 For those of you who have yet to embark on the journey of parenthood, I hope they won’t make you run for the hills. I wrote these stories so that I would never forget the little things that make parenthood one of the most amazing and rewarding experiences a person can have. Furthermore, I wanted to make sure I had a written record of it all to share with my grown children one day, so they could see all the crap they put us through. 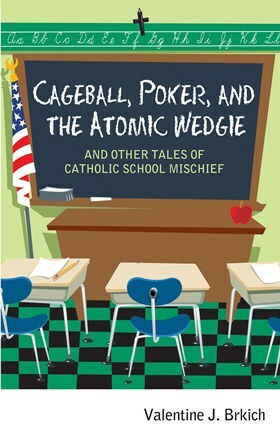 Cageball, Poker, and the Atomic Wedgie: And other tales of Catholic school mischief takes you back to that simpler time in life; a time before Twitter and Facebook; before American Idol, Justin Bieber, the Kardashians, or any other modern-day pop-culture Goliath whose name is good for SEO. ; a time when SPAM was just canned ham, and vampires were still ugly, frightening monsters, not dreamy heartthrobs with six-pack abs. Follow me and my friends through the hallowed halls of S.S.P.P. as we attempt to pass the time by relentlessly tormenting our teachers and by doing anything but actually pay attention in class. 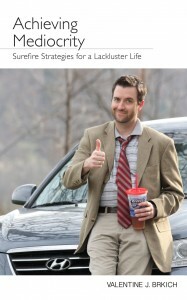 “It’s a rip-roaringly funny collection of mischievous mayhem!” – Some guy I gave $20 bucks. Bridgewater: A Narrative History of a Pennsylvania River Town is the story of Bridgewater, a small western Pennsylvania town located along the shores of the Beaver River. From its beginnings in pioneer times, to the booming canal years, to the years of decline, near extinction, and rebirth, Bridgewater has seen it all. Surviving flood after devastating flood, the loss of industry, and the indiscriminate wrecking ball of so-called progress, Bridgewater today is redefining itself as a destination for recreation and entertainment. The story of this tiny river town is one of ambition, ingenuity, and longevity, and its people are defined by their strong character, determination, and neighborly way of life. I have always had a close connection with Bridgewater. I spent a lot of my youth here visiting my grandparents, and my wife and I made Bridgewater our first home, living in the same house where my dad grew up. Throughout the book, I weave my own family’s history into that of the town’s, as I touch on the meaning of place in one’s life. The result is a personal, narrative history of the town through the eyes of one of its own. Also available as an eBook through Amazon.com. Like most males of the species, I had no idea what I was getting into when my wife and I decided to have children. Now, after years of living through the sleep deprivation, exploding diapers, temper tantrums, and all the other fun that comes with being a parent, I have put together a handy survival guide for new dads in order to help them adjust to their new life. Get Yourself An Inflatable Baby Sitter is a brief yet thorough collection of fatherly advice from someone who’s survived it (so far). Topics include: “It’s A Girl! Good Luck With That”, “Poop – It’s Not So Bad”, and “Embrace the Mess – You’re A Hoarder Now”. Through brutal (sometimes frightening) honesty, I give new dads an inside look at what they can expect in the coming years. The ebook also serves as an effective method of birth control. There are dozens of books out there on success, but very few on being just average. By the time I had reached 40, I had achieved a level of mediocrity rarely seen. Now I am sharing all my secrets for a lackluster life, based on the many, many wrong decisions I’ve made in mine. I think you’ll find that the book is written in a very readable way and with a level of honesty that’s, quite honestly, frightening.